College writing instructor John Maguire was feeling frustrated in trying “to turn poor writers into good ones”, but then he realized he needed to start with the basics. These kids don’t know what a good sentence is. They attempt to write papers with bizarre strings of words that are not sentences, and they don’t know what the problem is. Their high school teachers let them write fragments, and now they think of a fragment as a kind of sentence. They have been trained to accept fragments, and I can’t get them untrained. Papers cannot be made from terrible sentences. After that, the second part of the course “contained the skeleton of a “normal” comp course including argument, narration, thesis sentences, and arrangement of parts”. Other effective approaches to writing instruction such as the “Kerrigan method of ‘Writing to the Point” and’ the “Hochman Method” take a similar approach. The ‘sentence is the basic unit in writing‘, and author Ta-Nehisa Coates believes “teaching kids how to write compelling sentences is a lost art”. John Maguire, “Teaching College Students to Write”, John William Pope Center for Higher Education Policy, May 07, 2013. A new nonprofit has the potential to profoundly improve educational outcomes —including college completion— for low-income students. Called The Writing Revolution, the organization exists for one simple and powerful purpose: to teach K-12 children to think and write clearly. Teaching kids to write seems like a universal goal of our educational system. Yet it is not being met. Millions of students are graduating from high school lacking this fundamental skill. The fact that 76 percent of our high school seniors cannot effectively communicate in writing is inextricably linked to our nation’s abysmally low college readiness and completion rates. The Writing Revolution is based on a method of writing instruction developed for learning-disabled students by Judith Hochman. Hochman had a strong hunch that the same things that made her method so effective for learning-disabled students could also help students from lower-income families. Both groups often lack the rich linguistic skills needed to inform their written expression. As such, both groups can benefit immensely from consistent and structured exposure to the building blocks of language use. Sentence composition is at the core of the Hochman Method of writing instruction. … students learn that what words they use matter, and so does the order in which they use them. With enough practice, virtually every student who uses Hochman’s method gets better at turning words into meaningful sentences. Students then learn to use conjunctions and clauses to expand those sentences and make them more information-rich. Over time students learn to combine these information-rich sentences into paragraphs, and their paragraphs into essays. In that process, students learn to recognize what information is most salient to an argument, to take effective notes on what they hear and read, and to create complex outlines of their ideas. The Hochman Method enables students to constantly hone skills that are extremely relevant to academic success in K-12 and in college classrooms. The program is being piloted in four Washington DC public schools, with initial reports calling it a transformative process. Jennifer Wheary, “Want Students to Succeed in College? Teach Them to Write in K-12”, SparkAction, June 2, 2014. A follow-up to the topic of THE IMPORTANCE OF DETAILS along with an introduction to A CHECKLIST FOR REVISIONS are covered in this post. (This is the 18th post about my project to study and learn William Kerrigan’s Writing to the Point (WTTP) Six-Step method of writing an expository essay, first explained here.) For a recap, here are Steps 1 through 4. In his book Kerrigan offers an 11-step checklist for revising an essay, a tool that is consistent with his approach of writing instruction that offers direct and precise guidance incorporated into a systematic process. Here are the first few items from the checklist. Write an essay on a subject of your own choice As you write, be very critical of your use of sufficient detail. When you have finished your draft, refer to the checklist in Appendix II, focusing on items 3 and 4, details and specific example…. X Traveling is an excellent way to spend summer break. 1. Traveling is enjoyable. Most people enjoy going to new locations as a way to get a break from their routines. Although some choose extreme excursions and others prefer tamer travels, the opportunity to give the mind and body a taste of something different is agreeable to almost everyone. Ascending to the top of Kilimanjaro gives the outdoor enthusiast a thrill not matched by the more familiar climbing that he does on weekends. On the other hand, a relaxing week at a resort is just the kind of indulgent pleasure that appeals to other types of travelers. 2. Traveling is educational. A simple change in environment always teaches a traveler something new. Perhaps a traveler will learn something as basic as the fact that he does not like a humid climate and too much free time. Traveling to Paris, he may learn about French street fashion and the appeal of having a café au lait with brioche for breakfast. A visit to Washington D.C. presents the perfect opportunity to learn more about American history and government. Travel offers abundant learning opportunities of many different types. 3. Traveling strengthens relationships. Anyone who has traveled with family or friends knows that shared experiences in distant locales create unique bonding opportunities. Whether it’s sharing a breath-taking view of the Grand Canyon or waiting in a long line for lost luggage, traveling companions often get to know and appreciate new aspects of each other’s personality. That is one reason mother-daughter or father-son trips are highly recommended as a way to strengthen family relationships. The benefits of summer travel include enjoyment, education, and enhanced personal relationships. A writer should always be thinking about including abundant detail. With practice this will become an automatic part of the writing process. Using a checklist in the revision process makes it easier to cover all bases while ensuring that the correct habits are being reinforced. Because it is such an important aspect of the Writing to the Point method, THE IMPORTANCE OF DETAILS is revisited as a topic for discussion. (This is my 17th post about my project to study and learn the entire Six-Step method, first explained here.) For a recap, here are Steps 1 through 4. The importance of including abundant details is revisited as a topic because Kerrigan saw a strong tendency among developing writers to be excessively abstract and general. It may be because adding details can be hard work, and in a rush to get the composition done a student often neglects to go the extra length needed to add examples and concrete descriptions. It is also the case that a writer usually holds in his head a clear understanding of the message and context of his topic, and sometimes forgets that the reader needs more details to achieve a similar understanding. Being specific and concrete, as well as going into detail and using examples, add clarity and interest to writing. She happily plopped into an overstuffed chair with a look of immense relief on her face. He took a driving test. Sam nervously clutched the steering wheel as he listened intently to the instructions, his hopes of getting a driver’s license fading with every turn. Mark was slowly munching on a baby carrot. My next Kerrigan post will cover the assignment for this section, as well as the introduction of a fabulously helpful checklist for revising first drafts. Stay tuned! A SUMMARY OF SOME IMPORTANT CONCEPTS from Writing to the Point is presented in this post. A few of the concepts are listed below. (This is the 16th post about my project to study and learn the entire Six-Step method, first explained here.) For a recap, here are Steps 1 through 4. The rules must be followed. Steps 1, 2,3, and 4 are not rules that someone has decided on, like the rules of a game. They can’t be changed, as in the case of the elimination some years ago of the center jump in basketball. No, they arise out the very nature of writing, and are as necessary for writing as heat is for cooking, cloth for clothing, fuel for an engine. Sentences X-1-2-3 are at the core of a good essay. No one can write an essay on a topic. You must write a sentence about a topic, then write the essay strictly on that sentence. Once that sentence is well written, the essay nearly writes itself, because that sentence dictates what must be said. Always keep in mind your purpose of explaining something to somebody. Make that somebody one real or imagined person. Fit your tone to that person and try not to vary it. The overriding goal is to stick to the point. INTRODUCTIONS AND CONCLUSIONS ARE NOT ALWAYS NECESSARY, according to William Kerrigan’s method of Writing to the Point. (This is my 15th post about my project to study and learn the entire Six-Step method of writing an expository essay, first explained here.) For a recap, here are Steps 1 through 4. INTRODUCTIONS AND CONCLUSIONS ARE NOT ALWAYS NECESSARY! Kerrigan takes the unconventional view that essays do not require introductory paragraphs and concluding paragraphs. … If an introduction is necessary, then of course have one. But do not have an introduction just for the sake of having an introduction, any more than you would flap your arms up and down three times before putting on your coat — it’s pointless…. They often take up too much word space, far out of proportion to the body of an essay. An introduction can be distracting, leading the reader to a topic that is not the subject of the essay. It’s better to get right to the point than to beat around the bush at the beginning. If introductions and conclusions are used, they should be as succinct as possible. Obviously, this approach is very different from conventional teaching in American schools. But it still makes sense to learn Kerrigan’s method, for it teaches the value of concise expression and the skills useful in getting to the point quickly. Learning how to build effective introductory and concluding paragraphs can occur after learning how to organize and develop the body of a well-written essay. … can be an echo of Sentence X, or some short sentence in which you manage to drive the point of the them home. Write short rounding off sentences for three of the essays you’ve already written. Here are a couple of the sentences I wrote. Rounding off sentence for the essay from this post: Colorful foliage, crisp weather, and fun-filled activities all make autumn an exhilarating time of year. Sentence X was: Autumn is an exhilarating time of year. Rounding off sentence for the essay from this post: For all these reasons, a student must have a regular schedule of study. Sentence X was: A student must have a regular schedule of study. Less is more. Unnecessary verbiage detracts from the point of the essay. On the other hand, a catchy introductory paragraph should not be written until after the thesis statement (Sentence X) is written. IT IS IMPORTANT TO STICK TO THE KERRIGAN RULES. This is another topic that is discussed before moving past Step 4 of the Kerrigan method of Writing to the Point. (This is my 14th post about my project to study and learn the entire Six-Step method, first explained here.) For a recap, here are Steps 1 through 4. 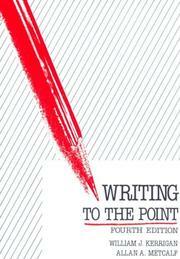 Purpose can also be called “meaning” or the “point”, as in Kerrigan’s book title, Writing to the Point. For the type of expository writing addressed by Kerrigan’s method, “the entirety of the essay should be devoted to making the writer’s point”. But before he can write the essay, the writer must know what his point is. The X-1-2-3 format helps the writer focus on formulating and expanding upon his point, as well as helping the reader comprehend the essay’s meaning. Why should the writer stick to the Kerrigan rules? Why can’t the writer be “creative”? For example, why does he have to put Sentence X at the beginning? In fact, a writer can be creative and put Sentence X, which is the thesis sentence, in a different location within the essay. It’s done frequently, with successful results. However, the writer must think of the purpose. and consider three things. First, your purpose cannot be just to be different which is simply eccentricity, or sometimes a mask for laziness. Second, your need to have Sentence X somewhere else must be very great indeed if it makes you sacrifice the marvelous advantage of letting your readers know at once what your point is. Third, if you don’t state your point at once, you must still guide your readers toward that point through a mass of material in such a way as to convince them they are moving clearly toward a point, without their ever being wholly puzzled and without their getting the idea along the way that they see your point when actually they are mistaken. To do that takes great skill. Do you have that skill? . . . You may develop it; but if you are going to develop it, certainly the beginning of the development will be getting the idea of point deeply and clearly fixed in your mind. And the best way I know to do that is to get lots of practice in writing essays based on the method in this book. The Kerrigan method is an instructional approach for developing writers. I think it’s particularly useful for struggling writers. If I were a teacher with a few highly skilled writers in my class, it’s unlikely I would have them strictly follow the Kerrigan method. They are ready to move beyond the strict format of the Kerrigan method. Breaking the rules is fine, but it takes advanced skill. Usually, that skill is only developed after much practice writing following the rules. WHILE REPETITION CAN BE IMPORTANT FOR ENHANCING THE CLARITY OF AN ESSAY, IT MUST BE BALANCED AGAINST THE POSSIBILITY OF PRODUCING A MONOTONOUS PIECE OF WRITING. A discussion of this topic is included before moving past Step 4 of the Kerrigan method of Writing to the Point. (This is my 13th post about my project to study and learn the entire Six-Step method, first explained here.) For a recap, here are Steps 1 through 4. An objection to keeping the same grammatical subject, a topic covered in my previous post, is that it would be too monotonous. Some writers like to mix things up, changing the perspective and tone of an essay to keep the reader engaged. That may work in some types of creative writing, but not for the expository writing addressed by Kerrigan’s WTTP method. Repetition is desirable. * It helps keep the writer on track and adds clarity for the reader. But Kerrigan suggests ways to minimize the monotony. Use pronouns. Instead of “George Washington” in every sentence, use “he”. Use synonyms, but don’t overuse them. Instead of “George Washington”, use “our first president”. Make every third sentence or so notably longer than the others. One way to do this is by sentence combining. Be sure every third sentence or so begins with something other than the subject. A good resource for teaching sentence composing is the series of books by Don and Jenny Killgallon, which works well for afterschooling or homeschooling. Write an essay on any subject. Try to keep the same grammatical subject throughout. Make one out of every three or four sentences notably longer than the others. Even if the essay turns out a little stiff and clumsy, it’s still excellent practice. Here is the essay I wrote for this assignment. X The end of the school year is hectic. 1. The end of the school year is a time of final exams. 2. The end of the school year is a time of special events. 3. The end of the school year is a time to prepare for the summer. X The end of the school year is hectic for many high school students. 1. The end of the school year is a time of heavy academic responsibilities. Final exams often count for a large part of the final grade, so most students must spend considerable time studying for them. End of year class projects are similarly time-consuming. Sometimes make-up work, like lab reports, must be completed before the last day of class. All this must be done with an eye to planning the class schedule for next fall. 2. The end of the school year is a time of many special events. For seniors, all the graduation festivities take up time in preparing and in celebrating. The prom requires numerous shopping excursions for the right attire along with planning for transportation and related details. A weekend of activities with friends often comes after the prom When you add in all the other graduations, confirmations, spring concerts, dance recitals, end of season sports events, and myriad other events common this time of year, it becomes clear what a hectic time it can be. 3. The end of the school year is a time to prepare for the summer. While some students will be spending the summer enjoying long, lazy days by the pool, most will be busy with various activities that need planning and preparation. A summer job often requires filling out many forms and interviewing with potential employers. Getting ready for travel, either with family or to summer camp, usually requires more work than a quick packing of a suitcase. A flurry of commotion is common as a teen begins a summer of volunteering, babysitting, summer courses, team sports, or other activities that will last until the beginning of the next school year. Focusing on these few simple techniques can help developing writers add cohesion and clarity to an essay while also avoiding a monotonous tone. As with the other WTTP lessons, practicing these techniques will help establish them as part of a student’s routine writing style. * Do you see what I did there?